Pop-Up Publicity was established in 2009. A new year of arts! 2016 finished off with a trip early December to Jindabyne with my hubby who was racing in L’etape. I spent my time with a solid hike to the top of Mt. Kosciuszko – the many snow drifts across the path and the strongest winds I’ve ever faced off, made for quite a challenge; a fun mountain dirt bike ride on the tracks around the lake (glad not to fall off); and a magical bush walk along the Thredbo River from the Ski Tube park to Diggers camping ground – was so pretty with wild flowers and curving tracks, kangaroos, wombats and a deer! We drove home to Sydney via back country Snowy Mountains National Park, passing through the highest town in Australia – Cabramurra at 1488m – to stay overnight at the Country Club in the little town of Talbingo, (the birth town of Miles Franklin), so we could explore the Yarrangobilly Caves the next day. Amazing and decorative ancient limestone chambers, with a good dirt road track in. The Country Club, with a big mob of kangaroos on the lawn, was pretty cute too and even the Chinese Restaurant was good! A week later I was off on a little driving break to Adelaide and Kangaroo Island, with two dear friends. We stayed a few nights in the log cabins at Hanson Bay and totally recommend. The fab Southern Ocean Lodge was a few km away, but we still had the same coastal view on a far more reasonable budget. On our way back to the city we explored the Fleurieu Peninsula driving back through McLaren Vale and the Adelaide Hills. The last night we stayed in one of the newly renovated workers cottages at The Bridgewater Mill. Perfect and totally recommend this one! And finished with lunch at Jamface at the Adelaide Central Market. Wow! for these markets. Only wish they were in Sydney. Christmas was spent in Brisbane with my big family and a highlight was visiting the Margaret Olley Art Centre in Murwillumbah, on a day trip with two of my sisters, finishing off in Byron Bay for dinner and a long drive back to Bris. 10-29 January 2017 l OPENING Thursday 12 January 6-8pm. WATCH their Behind-the-Scenes Video l And browse their website for a little daydreaming. Tom Evangelidis at Black Eye saw their show last year at Danks Street, loved it and invited them for the gallery’s Summer Show. All large scale prints and many new images. If you missed these first time around, don’t miss them again. 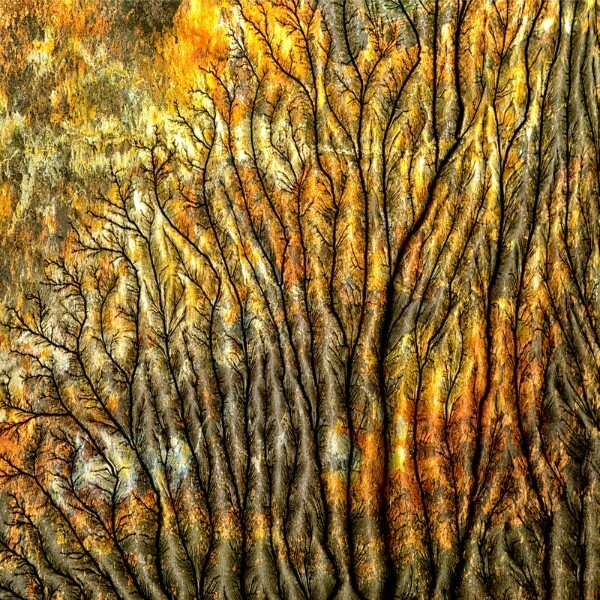 Aerial photos of Kati Thanda-Lake Eyre – stunning, abstract, painterly, mystical, patterned and beautiful. A superb collection of photographs of a landscape few will ever see and even fewer will see from above. And there is lots of water in the lake! The group go under the name The Light Collective, and between them all the list of awards for their landscape and nature photography is more than impressive. A feature in this fortnights Edition of Big Issue Magazine & a superb profile here on L’Oeil de la Photographie by Australian photography writer, Alison Stieven Taylor. This entry was posted in Uncategorized on January 12, 2017 by cassiefrench. 03 – 12 November 2016 l OPENING Thursday 03 November 6-9pm. SPECIAL GUEST to Open the Exhibition: Acclaimed landscape photographer, Ken Duncan. 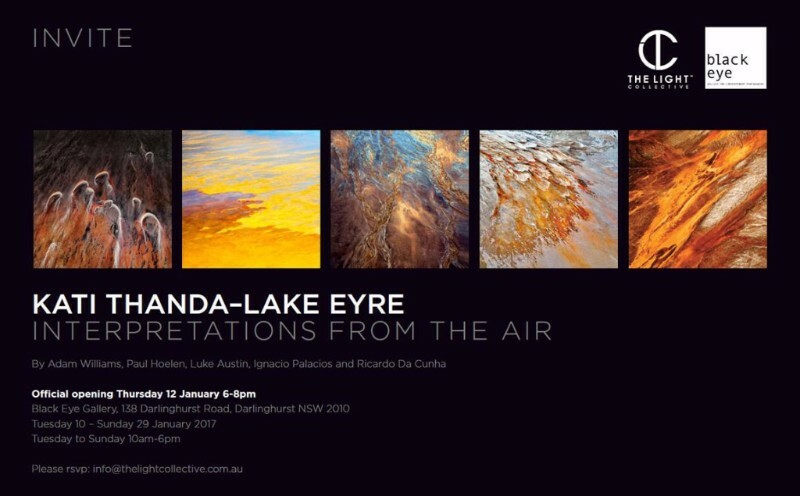 Four incredible and dedicated photographers, an adventurous off-road 4WD trip and three charter plane rides above Kati Thanda-Lake Eyre delivers a collection of stunning, abstract, painterly, mystical, patterned and beautiful images. This is a superb collection of photographs of a landscape few will ever see and even fewer will see from above. The group go under the name The Light Collective, and between them all the list of awards for their landscape and nature photography is more than impressive. This entry was posted in Uncategorized on November 2, 2016 by cassiefrench. If you missed the Opening last week, don’t worry, just be sure to visit on another day – less people and you see the show much better anyway. I love the sculptures of Sally Simpson. It is a strange joy to see them 3D – they are bigger and more engagingly endearing than you can imagine. If you have kids – take them too – kids love these beautiful odd figures. Sally also has another exhibition just Opened at Benalla Art Gallery (in Victoria) of earlier work – only a 2hour drive from Melbourne. She also recently won the 2016 Queanbeyan-Palerang Regional Council Art Awards & is a Finalist in the 64th (2016) Blake Prize Award. LINK TO FULL VERSION OF SEPTEMBER NEWSLETTER – there is a whole lot more! This entry was posted in Uncategorized on September 13, 2016 by cassiefrench. Photographer Michael Haylen changes the way we look at the natural world. He says, It’s more about the way the eye reads an everyday subject when it is blown-up and depicted large…you get the sense that it’s not really the object that matters in the end. Form, light, texture and soft muted colour all play a part in these curious and lovely observations of our world. This entry was posted in Uncategorized on August 12, 2016 by cassiefrench. Andjana Pachkova. 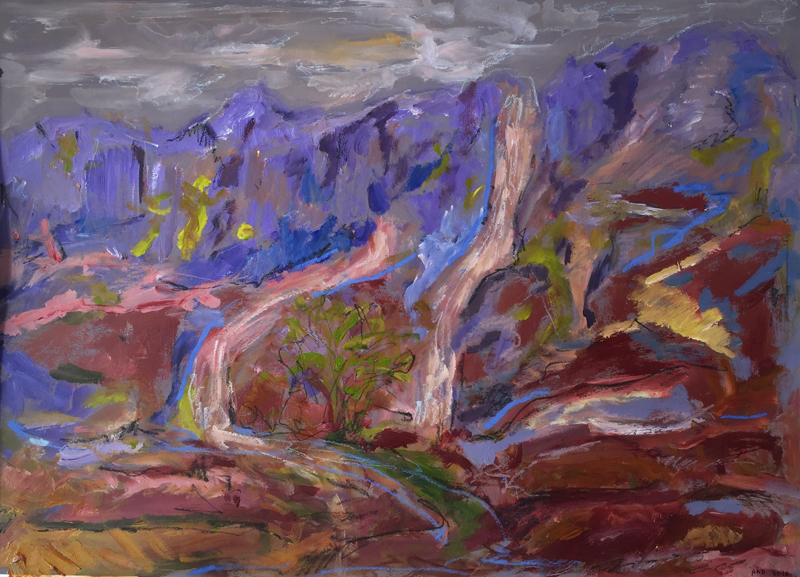 The Outback through my European Outlook (mixed media on pastel paper). This entry was posted in Uncategorized on May 14, 2016 by cassiefrench. 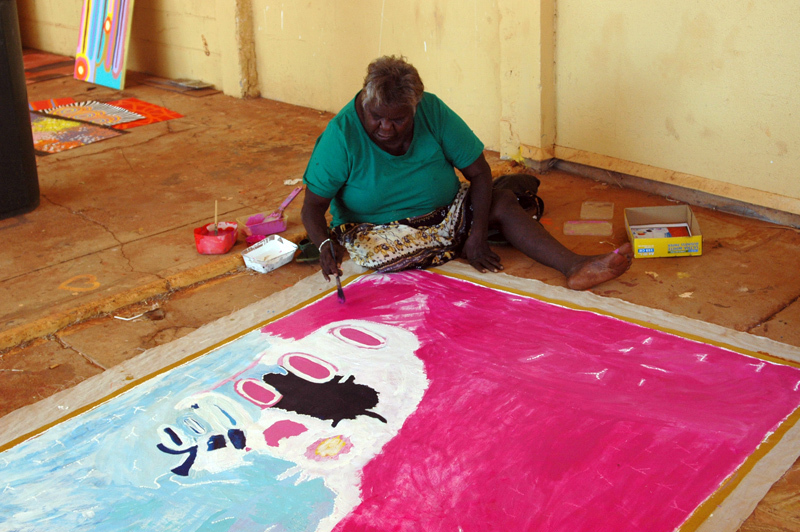 Artist Kitty Napanangka Simon painting at the Warnayaka Art Centre, Lajamanu, NT. Special Guest to the Opening on 5 March was the Artist, Kitty Napanangka Simon, accompanied by Warnayaka Art Centre Manager, Louisa Erglis. Kitty Napanangka Simon (b.1948) is a Warlpiri woman from Lajamanu, on the northern edge of the Tanami Desert in the Northern Territory. She is one of Mina Mina’s custodians and a keeper of Women’s Law for this remote desert landscape. Mina Mina is a sacred place to Warlpiri women. Her unique paintings, known for their quality of colour, dot and line work, are feminine and beautiful. Interview & Review, Australian Financial Review Sat 27 Feb. Written by Steve Dow. Opened by Special Guest Sandy Edwards, Photographer & Curator. 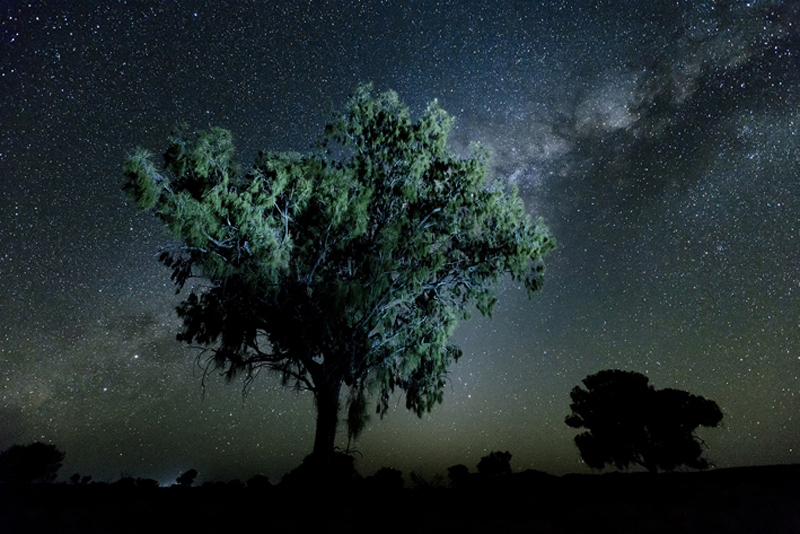 Greg Weight captures the night skies of the Central Desert in all their spectacular, glittering beauty. Dossing down with his swag under this luminous night canopy, often camping out alone, Greg photographs this landscape with intimate knowledge – he has been travelling to NT for many years now. There are also daylight photographs in this series, sharply contrasting the rocky red earth of this remote desert country. One day only. FREE! Saturday 12 March 11am – 6pm. A big colourful day joyfully celebrating vibrant African communities in Sydney and across the country, coming together to celebrate different culture, food, fashion, music, performance, literature and sport. Last year 38 out of 53 recognised African countries were represented. This year they are expecting over 40! Now in its 8th year, Africultures is Australia’s biggest African cultural festival. As the Director of the Festival, Fatma Mohamed, says: This is a really soulful and community based festival. We don’t care about the colour of your skin, everyone is welcome here…and a trip to Western Sydney is a lot closer than a trip to Africa. Check out their website and facebook pages as loaded with info – including the performance schedule and sports tournaments. The fashion parade at 2pm is not to miss! And the food. 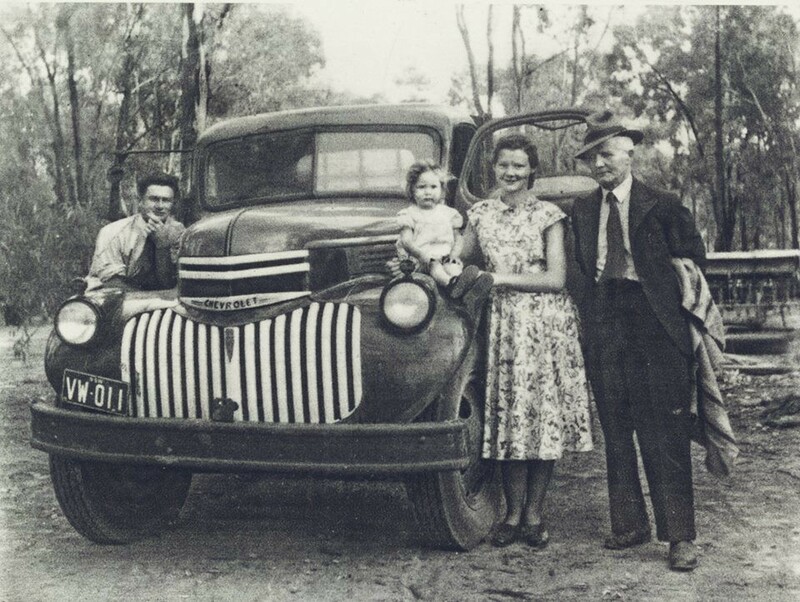 When photographer and writer Sally McInerney’s aunt found a handful of half-destroyed family photographs in her garage, a labour of love was set in motion. Sally added these photographs to her own collection and the resulting artist’s book also includes eleven photos by Sally’s mother, the late Olive Cotton – one of Australia’s greatest photographers – which had never before been published. Family Fragments comprises 37 haunting solar plate etchings and handmade paper folders with beautifully handwritten inscriptions by Sally, providing a rare insight into the private lives of one of Australia’s artistic icons and her husband’s family. (Text from State Library NSW website). 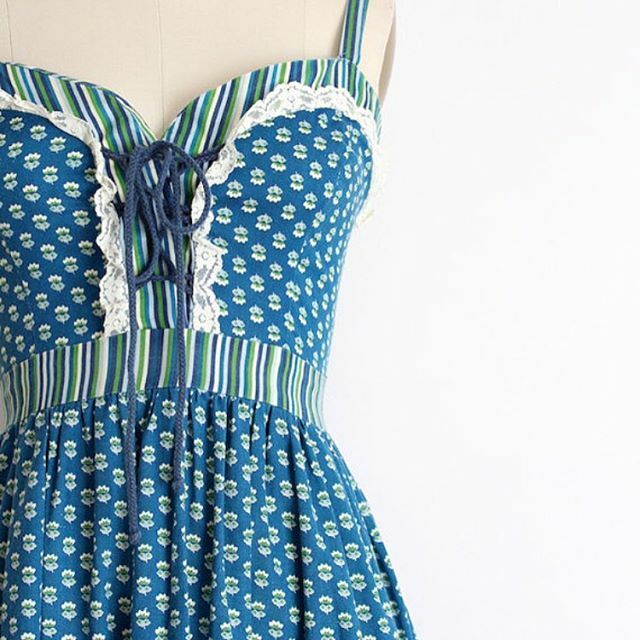 Adorable vintage dresses and skirts and accessories and a website to go to if you want to buy. I just like looking and liking. Go Yum or Go Home. This is their byline: ‘Based in Sydney, we’re determined to bake, eat & drink our way through recipes & kitchens everywhere with the motto – go yum or go home’. Here is a mix of great home cooking, eating out about town and great pics. This one taken at breakfast, Penny University Cafe (Canberra). Yum for sure! (no bias but it is one of my daughters and her bf btw). I had a couple of days in Canberra a few weeks ago and on our second morning found this great cafe in Kingston – and I totally recommend. Food delicious. Coffee good. Staff friendly. Atmosphere very pleasant. You can even buy freshly-roasted-on-premises-coffee, as well as inhouse made pickles and chutneys. Too good! And all very stylish. 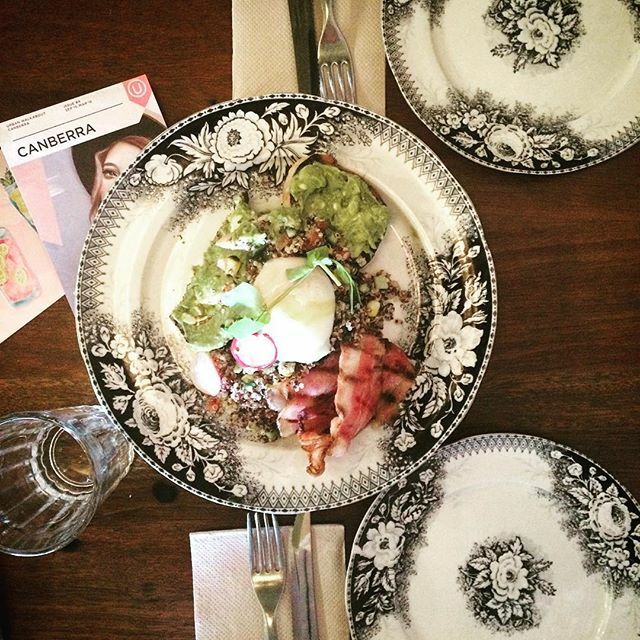 I will definitely go back and only wish I could find a cafe like this in Darlinghurst. Penny University Cafe – Coffee Roasters has an interesting history to its name also, based on the first coffee houses in 17thC London costing a penny to enter. Penny University Cafe – Coffee Roasters, 15 Kennedy Street, Kingston. This entry was posted in Uncategorized on March 10, 2016 by cassiefrench. 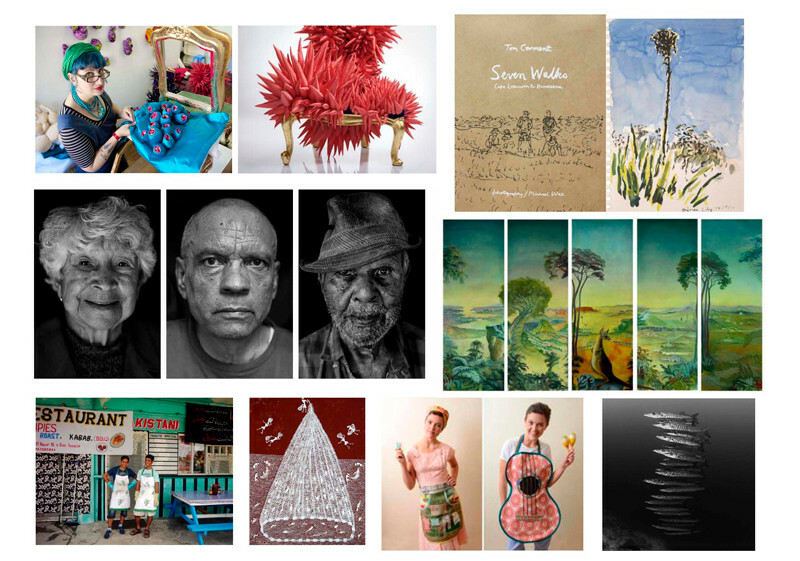 December Arts Pop-Up Newsletter… summer holiday season. The soul of India is sometimes said to be found on their railway system. 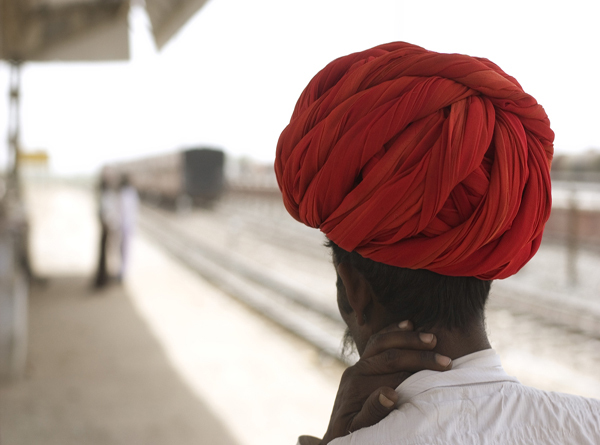 Australian photojournalist and travel writer Angus McDonald (1962-2013) spent many years travelling on India’s trains. In this personal odyssey, he shares all the colour and life and small human details that make such journeys rich. It is also a stunning book with an endorsement by fellow traveller, Michael Palin. 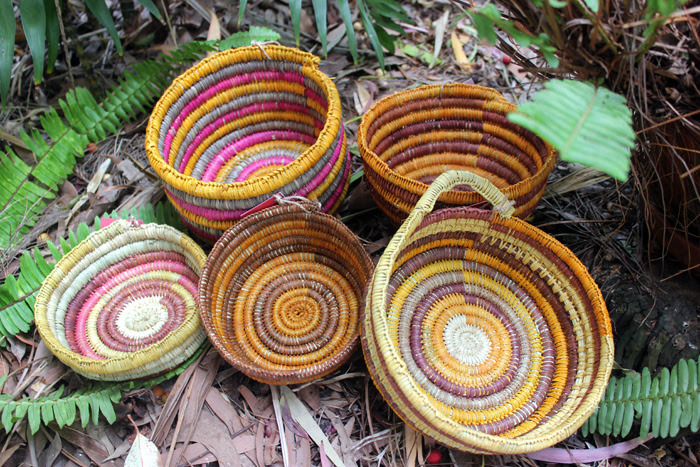 A selection of coiled pandanus baskets – natural fibre with bush dyes. The annual colourful Coo-ee Christmas show is on. What a great excuse to visit the gallery if you haven’t been – one of my Sydney favourites – and buy some artwork for yourself or a friend of course. There are baskets, paintings, crafted toys, sculptures, mimi spirit poles. Big and small artworks. Under $100 or test your credit limit. To see the collection click and what is still available click here. 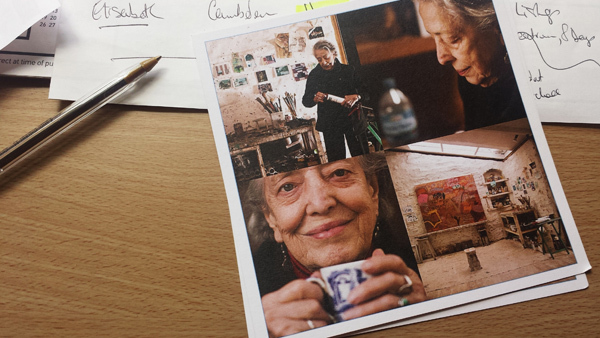 The Elisabeth Cummings catalogue on my desk with notes. Portraits in catalogue courtesy of Roller Photography. 17 November – 19 December 2015. This is a most beautiful​ collection of new paintings by one of Australia’s most influential living painters. 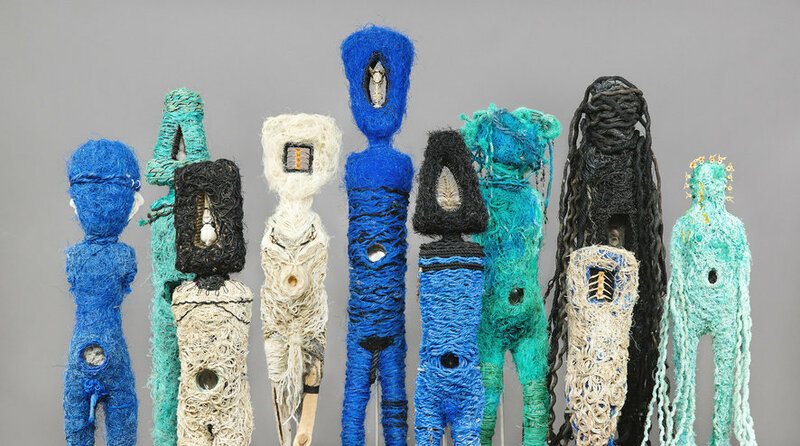 Imagine how many artists she has influenced in her creative lifetime?​ Elisabeth is also one of the artists exhibiting as part of the Destination Sydney Exhibition. Michael Keighery holding the original diary of his Great Uncle Frank. The diary is all written in Pitman Shorthand. On the right are three of Michael’s ceramic sculptures made from the template of artillery shells, in the style of ‘Trench Art’. Dead Man’s Penny by Michael Keighery. An exhibition dedicated to the memory of Michael’s great uncle, Frank Keighery, who died at Gallipoli in 1915 at the age of 21. The families of all British and Australian soldiers killed during WWl received a medallion from the British Government. Ironically it became known as the Dead Man’s Penny. Listen in to ABC RN Life Matters Interview with Michael from 03 December. View Micheal talking about his work and a guide around his studio on YouTube. 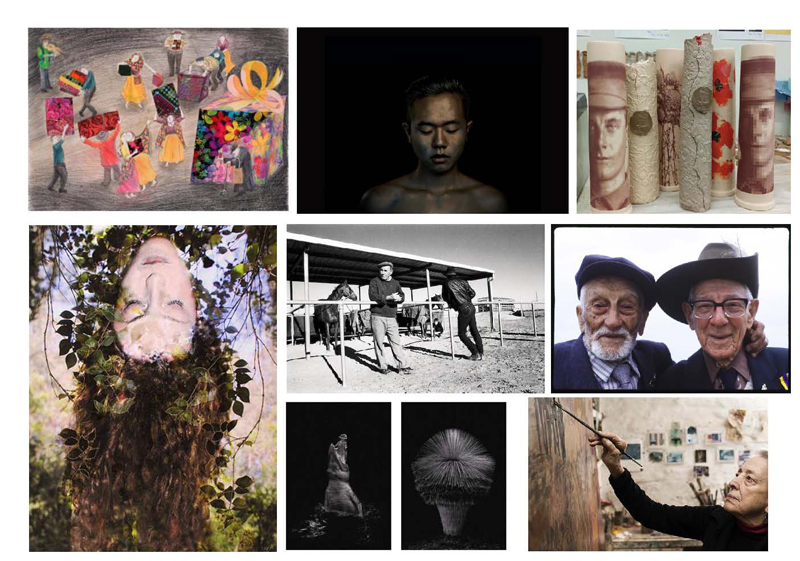 Thank you to all the fab artists and galleries I worked with this year. 2015 has been a year of colour and stories! Margarita Sampson. Infectious Desires. 25 Feb – 14 Mar 2015. Stanley Street Gallery, Darlinghurst. Tom Carment & Michael Wee. Seven Walks: Cape Leeuwin to Bundeena. New book release. Asher Milgate. Survivors. 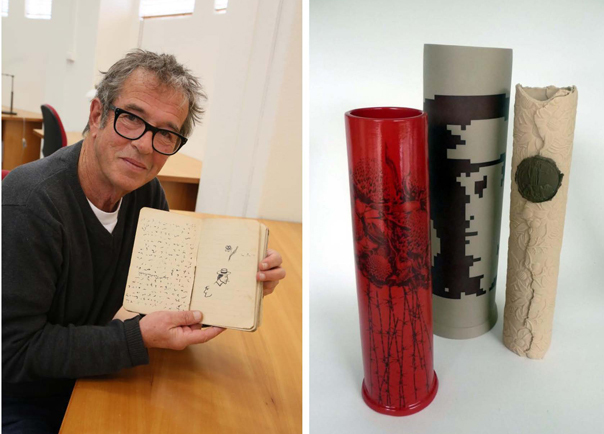 07 Mar – 10 May 2015 Western Plains Regional Gallery; 01-29 Aug 2015 Macquarie Hall, Wellington; Acquisition Meeting arranged with the State Library NSW. Helen S. Tiernan. Farming without Fences. 29 Nov 2014 – 17 Jan 2015. Coo-ee Gallery, Bondi. Ronnie Heng. Dive Into My World. 27 Jun – 10 Jul 2015. Blankspace Gallery, Darlinghurst. Kim Carpenter. Art for the Theatre. 14-25 April 2015 (Danks Street ll Gallery + Acquisition Meetings established with the State Library NSW + The Powerhouse Museum, Sydney). Michael Keighery. Dead Man’s Penny. 26 Nov-20 Dec 2015. Janet Clayton Gallery, Paddington. Vedat Acikalin. Gallipoli Then & Now: Bonds Forged by War. A national Touring exhibition to Hobart (Aug), Sydney (Aug-Oct), Perth (Oct), Melbourne (Nov) & Canberra (Dec). Curated by Sandy Edwards. Rodney Schaffer. Luna. 18-29 August 2015. 45 Downstairs Gallery, Melbourne. Elisabeth Cummings. New Paintings. 17 Nov-19 Dec 2015. King Street Gallery on William, Darlinghurst. 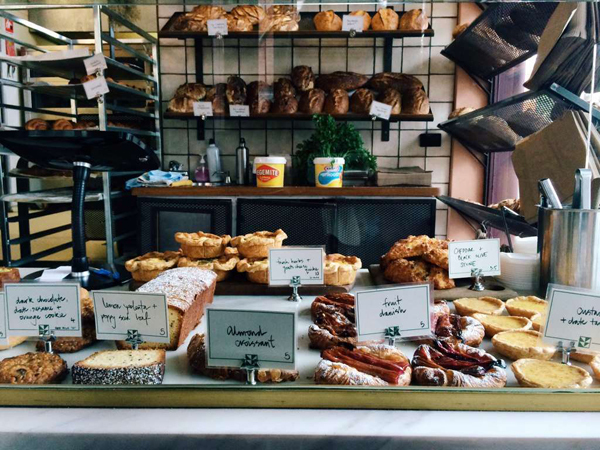 Nothing goes wrong here – the bread, pastries, coffee, salads and the staff! The best cake has to be the Persian Love Cake – it has everything you want in that little package. I love this pic with the giant Vegemite and Kraft Peanut Butter tubs. It can get crowded with not many seats inside, but what the hey. Sit outside. Here’s Time Out Sydney’s review. This entry was posted in Uncategorized on December 23, 2015 by cassiefrench.